Glacier National Park is a wonder all its own, with plenty of exploration and adventure to keep you busy for the entirety of your stay. But the communities that surround the park are infused with the same spirit of otherworldly splendor. Our charming small towns welcome visitors with restaurants, shops, museums, galleries and, best of all, authentically Montanan western hospitality. 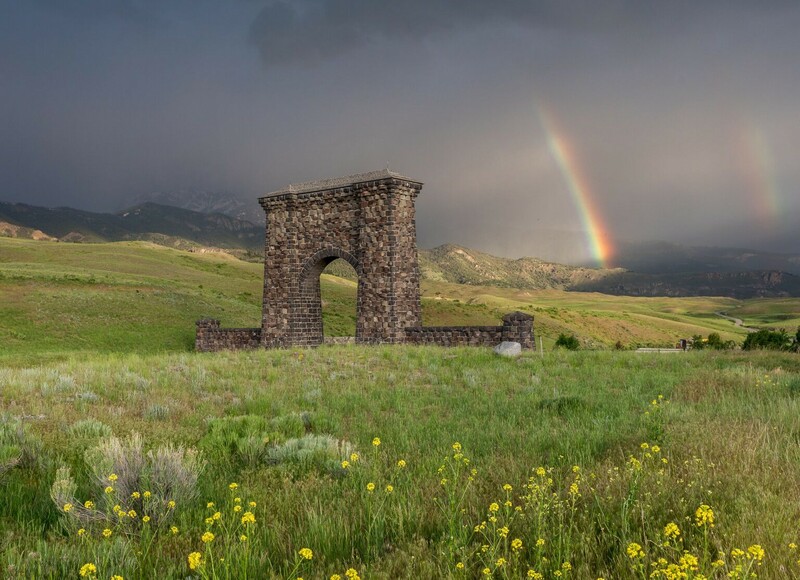 To the east, St. Mary, Babb, Browning, Cut Bank and East Glacier Park provide multiple launching points for exploring the Blackfeet Nation—complete with guided tours and incredible history—and central Montana. Operated by Belton Chalets Inc., Granite Park Chalet is a National Historic Landmark that was constructed by the Great Northern Railway in the early 1900s. 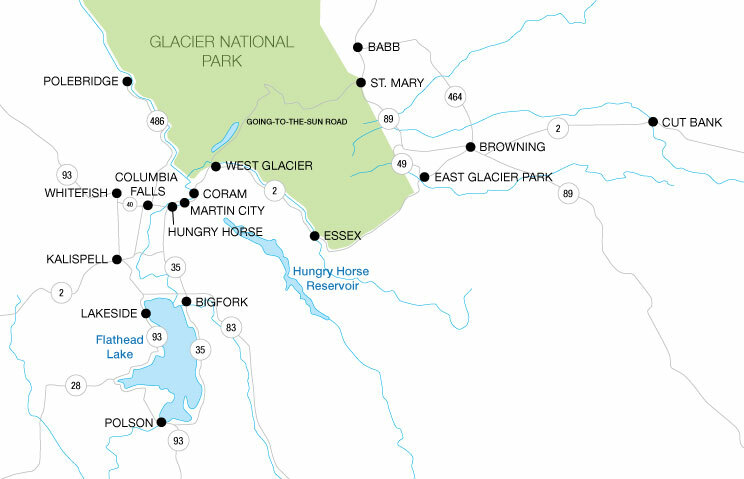 To the west, Essex, West Glacier, Lakeside, Hungry Horse, Coram, Martin City, Columbia Falls, Polebridge, Bigfork, Whitefish and Kalispell are ideal towns from which to base your trip. Along with easy access to the park, each community offers access to incredible outdoor recreation in the Bob Marshall Wilderness Complex, expansive trail systems in the Flathead Valley, water recreation on Flathead Lake, on-mountain offerings at Whitefish Mountain Resort and incredible food and drink scenes. Discover Flathead Valley communities, activities, events and lodging. Stop by the Glacier Park Conservancy Book Store to support park activities and programs. Swap stories over local brews at Backslope Brewing. Savor handcrafted whisky and spirits “so close to Glacier you can taste it!” at Glacier Distilling. Go green at the “must play” Meadow Lake Golf Course. Take on a treetop adventure with unforgettable views from Glacier Zip Lines. Don’t miss out on family fun at Montana’s largest waterpark, Big Sky Waterpark. Enjoy picturesque Montana fly-fishing and rafting on the Flathead River. Experience the anomaly for yourself at Montana Vortex and House of Mystery—it’s internationally famous. For family fun in the Valley, take the kids to Amazing Fun Center. Looking for a good old-fashioned swimming pool? Visit Pinewood Park Aquatic Center. The North Fork – Polebridge (Don’t miss the famous Polebridge Mercantile). Bad Rock Canyon/Hungry Horse, Martin City, Coram, West Glacier, Essex. Recreation abounds with camping, boating and hiking opportunities. Head out for huckleberry picking, a quintessential Montana experience. Visit Montana’s highest dam: Hungry Horse Dam and Visitor Center. Visit Conrad Mansion for a slice of history and railroad glory-days architecture. Discover Glacier National Park art and memorabilia from Hockaday Museum of Art. Learn the local history through interactive exhibits for the entire family at the Museum at Central School. Enjoy small-town charm and western hospitality with a self-guided walking tour of Historic Downtown Kalispell. Get a bird’s-eye view of the entire valley at Lone Pine State Park. Explore Foy’s to Blacktail Trails at Herron Park—only 10 minutes from town. Bike from downtown Kalispell to Flathead Lake on a non-motorized “Rails to Trails” paved trail system. Golf Kalispell’s two 18-hole courses, Buffalo Hill Golf Course and Northern Pines Golf Club. Get Your Shop On, Tax Free! Visit Historic Downtown Kalispell for locally made crafts, clothing, jewelry and souvenirs. While downtown, find several handcrafted ways to wet your whistle: Kalispell Brewing Company, Bias Brewing, SunRift Beer Company and Vilya Spirits. And with the number of coffee shops and restaurants that have opened their doors on Main Street, your night out will plan itself! Peruse the North-End District for national-brand camping supplies, clothing and footwear. Exploration is easy with visitor kiosks throughout town featuring maps, travel guides and activity/event posters. Catch a ride with daily service from Whitefish to Apgar Visitor Center and Whitefish Mountain Resort (July 1 to September 4). Bring your wheels on bicyclist-friendly buses with racks for up to three bikes. Taste the age-old tradition of a “gravity-flow” brew house at Great Northern Brewing. Get centered at Bonsai Brewing Project, a community-raised brewery featuring craft beer, live music...and yoga. Taste the rugged landscape and the heart and soul of Montana at Spotted Bear Spirits. Get your morning buzz at Montana Coffee Traders Roastery. Play on Whitefish Lake, with three public-access points. Explore 42 miles of dog-friendly trails and scenic overlooks on The Whitefish Trail. Drive one home on Whitefish Lake Golf Club’s 36-hole course. Soar through the trees, high above the slopes on Zip Line Tours. For “an obstacle park in the trees” visit Aerial Adventure Park. Take sliding to a whole new level on the Alpine Slide. A must-do Montana attraction—Scenic Lift and Gondola Rides. Taste Montana with mountaintop dining at the Summit House. Go for a ride on smooth-flow, lift-accessed mountain-biking trails. Take a hike, literally, with miles of trails to explore. Take in a show at Bigfork Summer Playhouse, the finest live professional repertory theater in the Northwest. Taste award-winning craft brew at Flathead Lake Brewing Company, winner of two World Beer Cup awards. Cruise the lake on a Far West Boat Tour. Cast a line on a chartered fishing boat. Play on the water with kayaking and SUP rentals/tours with Sea Me Paddle. Public Access: Somers Bay, Lakeside Marina, Volunteer Park and West Shore State Park. “Think Local. Drink Local.” at Tamarack Brewing in Lakeside. Take in the tunes at the Lakeside Town Center Concert Pavilion. Enjoy a variety of local dining favorites including Glacier Perks Coffee House. Shop local at the Columbia Falls Farmers Market. Shop local at the Whitefish Downtown Farmers Market. Picnic in the Park at free outdoor evening concerts in Kalispell. Picnic in the Park at free outdoor lunchtime concerts in Kalispell. Shop local at the Bigfork Farmers Market. Shop Local at the Cut Bank Farmers Market. Shop local at the Columbia Falls Community Market. Discover local artists at Whitefish’s First Thursday Gallery Nights. Kick up your heels at Kalispell’s Thursday!Fest, a weekly street festival boasting music, food and local brews, arts and crafts. Shop local at the West Glacier Farmers Market. Shop local at the Kalispell Farmers Market.